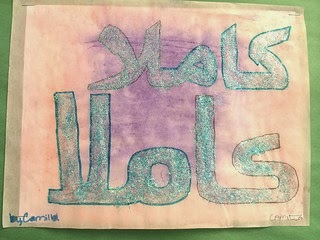 Middle school students at Gardner Pilot Academy in Allston have been spending time learning about Arabic calligraphy. 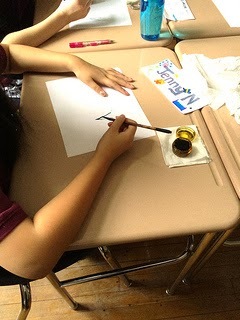 Last week, they discussed the origins of Arabic calligraphy and practiced traditional writing techniques, using bamboo and ink. 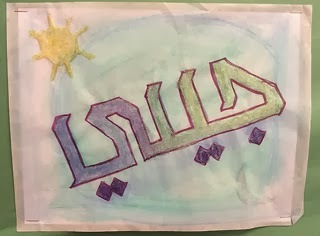 After watching videos about graffiti artists and how they turn large wall spaces into public murals using text, the students began to recreate their own small versions of graffiti art using Arabic text. They learned how to write characters that spelled out their own names, and decorated their pieces using markers and glitter to create their own special logo! 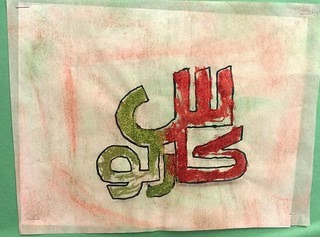 In the next class, they were taught about Arabic art and history, and how it related to the culture. They looked at pieces of early and medieval Arabic art housed in the Metropolitan Museum, such as bowls or manuscripts that illuminated the art of calligraphy in these times and how it affected art and culture and the impacts it had. 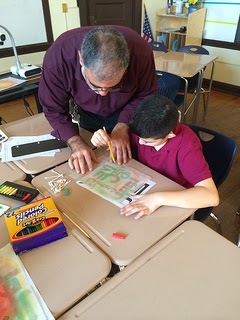 They then began to create their own patterns, using a connect-the-dots technique, which will be used on their final project, a big mural encompassing all the Arabic characters and techniques they have learned. Calligraphy is an art form that has a lot of potential, and is often overlooked. It is an ancient art form that is used for communication, and has led to important contributions to society – for example, a calligraphy class helped Steve Jobs to create the Apple computer, and if not for his calligraphy skills computers may not be what we know them as today. If these students continue their interest in the subject, who knows what they may be able to create!